The retractable doors to the ambulance bay slide open and an unresponsive “Code 3” patient is rushed into the NorthBay Medical Center Emergency Department. 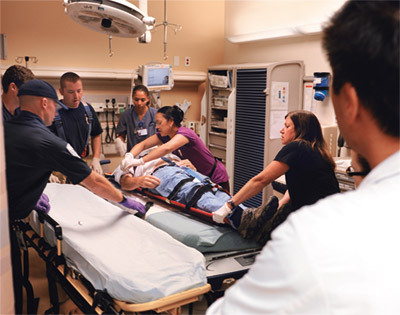 Within seconds, the patient—a heavy-set man in his 60s—is surrounded by a team of caregivers working feverishly to save his life. Paramedics inform Arnold Cruz, D.O., the attending physician, that the man was discovered lying face down in the kitchen by his wife—and that family is en route. With calmness and clockwork precision, drugs are administered, vital signs are assessed, medical information is procured and copious notes are recorded as members of the ED team take turns frenetically performing chest compressions. Meanwhile, in the adjoining hallway, a long-haired man wearing handcuffs is being ushered in by a police officer. His face is bloodied, his eyes glazed. Just moments before his arrival, nurses were busy tending to an elderly woman with a 104-degree temperature and a patient suffering from a life-threatening pregnancy. In the hallway, one family waited to find out what was causing their baby’s allergic reaction, while a mom, her son and a niece, seated on a gurney, were waiting for a physician to check out a case of ringworm. Through it all, the waiting room remains crowded. Welcome to the ED, where controlled chaos is a way of life and the ability to think quick, handle stress and be empathetic and ever-versatile are prized personality traits. NorthBay Healthcare operates two Emergency Departments around the clock—the one in Fairfield and one at NorthBay VacaValley Hospital in Vacaville—staffed with 122 employees, a team of surgeons, attending physicians and specialty hospitalists. 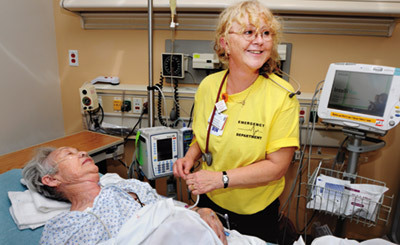 In 2010, more than 60,000 patients were treated. Dr. Mark M. Popil, M.D., a 40-year veteran of the ED, knows the terrain better than most. “To succeed here, you have to like the style of the practice—dealing with the unknown and uncontrolled situations,” he says, adding that teamwork is essential. “If you can’t work together, you can’t take care of the patients. It’s that simple,” Popil says. That’s why every member of the NorthBay team who plays a role is important. The hub of the ED is a U-shaped counter adorned with computers, monitors and telephones that rarely stop ringing. The night’s lead nurse, Jean Johnston, R.N., is stationed here, along with ED technician Shawn Vasquez. Johnston runs the electronic tracking board, a large, wall-mounted screen that provides a rundown of each patient and which of the department’s 19 rooms they occupy. Relying on a system of colorful icons, she is able to instantly alert doctors and nurses to any updates with a simple click of a mouse. Vasquez, a self-described “adrenaline junkie,” is a whirlwind of activity—paging doctors, calling other hospitals for medical records and serving as the ED traffic cop. ED Nurse Missy Smith, attending patient Akemi Kenney of Fairfield, pauses to give Donna, the woman’s daughter, a reassuring smile. Later that same night, in the VacaValley ED, things are just starting to calm down. Doctors and nurses found themselves tending to a 60-year-old woman who came in experiencing “heartburn-like” symptoms, only to learn she was having a heart attack. Now, lead nurse Jennifer Erickson is on the phone to NorthBay’s Cardiac Catheterization Lab in Fairfield, providing EKG results and other medical information as the patient is transported there. Meanwhile, in a nearby room, Christine Lowe, R.N. is checking in on her patient, Dan Johnson, and proving to be a soothing presence. He’s a Vacaville resident who arrived in the ED complaining of stomach pain and discovered he had pneumonia. Despite the drama, the overall pace in Vacaville this night is slow and steady. But Erickson and fellow nurse Gina Hosking know that can change at a moment’s notice. They both recall working a late shift in September two years ago that became a wall-to-wall frenzy. Erickson insists that ED nurses need to treat every case as an emergency, no matter what the severity might be. Whether dealing with a sore throat or a gunshot wound, she respects the fact that a patient’s anxiety level is elevated, and that they would much rather be somewhere else. Through the years, she and her co-workers have experienced the anguish of watching patients take their final breath. But they also have felt the thrill of sending patients and family members out those ED doors with a sense of relief or even joy.